In less than a week, my first comic book will come off the printers, and begin a 1,000-mile journey to my home. A few days after that, I’ll hold a copy in my hands for the first time. This is, to put it mildly, a pretty awesome feeling. 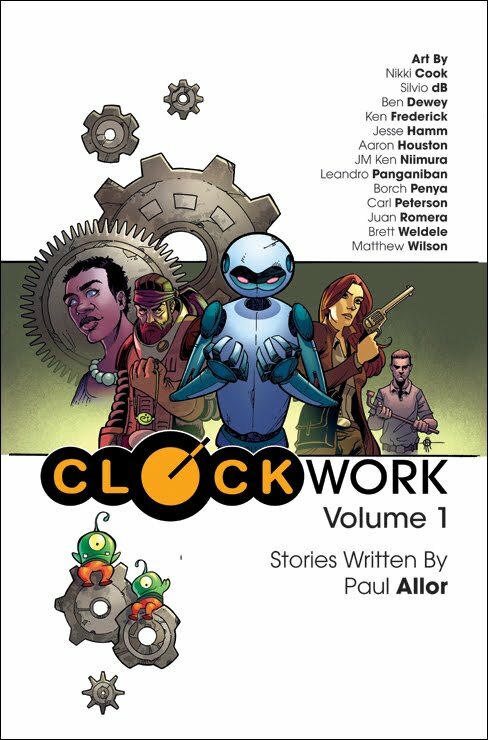 Clockwork, Volume 1 contains twelve stories, each drawn by a different artist, including JM Ken Niimura (I Kill Giants), Brett Weldele (The Surrogates) and Nikki Cook (Memoir). A year ago, a project of this scope, with this artistic talent on board, this early in my career, would have seemed impossible. But the knowledge, skills and support I’ve gained through Comics Experience made the impossible possible. My Comics Experience involvement began in Andy Schmidt’s Intro to Writing class, where each student completes a script for a five-page comic. Andy taught us that writing a five-page story is more difficult than a longer work, and that if you can tell a complete and compelling story in five pages, you can also do it in twenty-two. After the class ended, I decided to put those lessons to use. I figured that if writing short comics is more difficult than longer works, then I should continue to hone my craft on five-page stand-alone stories. Fast forward to less than a year later, and I’ve written twenty-four of them. 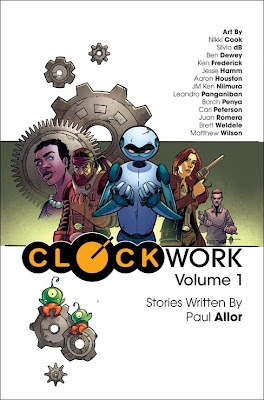 The first twelve appear in Clockwork, Volume 1. The stories are all over the genre map, from wacky sci-fi action to quiet slice-of-life, and everything in between. But they have one thing in common: every one of them incorporates the lessons I learned from Andy Schmidt. Every one of them is a call back to my writing class, where, step by step, Andy took us through the process of developing, plotting and scripting a comic story. Andy taught us the basics of story and the importance of character. He taught us about conflict and turning points and the rules of good dialogue. Whether I’m writing about space pirates, Old West cowboys or monster hunters, those same building blocks apply. But my Comics Experience involvement didn’t end there. I also took the Lettering and Production class, taught by veteran letterer Dave Sharpe. This class gave me a newfound respect for letterers, and allowed me to letter nearly every story in my book. 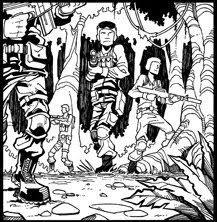 I also recently completed the Introduction to Comic Art class, taught by Robert Atkins. I’ll never be a great artist (or even a good artist! ), but I took the class to learn about the fundamentals of sequential storytelling, and Robert provided exactly that. I believe the insight I gained in that class will make me a better writer, and a better collaborator. Finally, I’m also a member of the Comics Experience Creators Workshop. The workshop is a true community, where writers and artists come together to critique each other’s work, trade industry news, and discuss collaborations. I met two of the artists in Clockwork, Ken Frederick and Carl Peterson, through the workshop. Additionally, several of the stories in Clockwork were put through the workshop, and I’m continually amazed by the depth and quality of the critiques I’ve received there. If you want to be a comics creator, Comics Experience is the place to start. Trust me, I know. If you’d like to check out Clockwork, you can read it for free in Web comics form at www.clockworkcomic.com, and purchase the hardcopy at govtcomics.bigcartel.com. Drop Paul a line at paul@govtcomics.com to let him know what you think! Paul, you are a great metric for the CEX bar of talent! Just ordered my copy. Can't wait! !